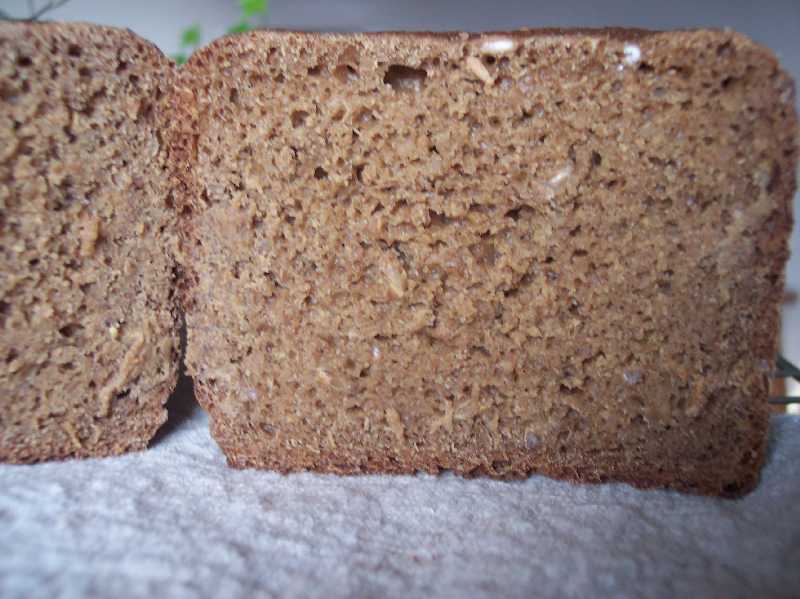 This is an 83% rye bread with a whole and chopped rye soaker and leavened with a ginger beer barm. As part of the total hydration it includes water that has been infused with fresh ginger to lend an accent of fresh ginger throughout the bread. Once the barm had become active and bubbly (approximately 15 hours) it was mixed with the other ingredients and the dough bulk fermented for 50 minutes at 82F inside the Brod & Taylor Proofer. It was then shaped and panned in a 9x4 Pullman tin, and placed back in the proofer for a final rise of almost 2 1/2 hours. There was a point where I wondered if the dough would rise enough to even bother baking off, but was confident the barm had been strong and lively when it was added to the mix, so I waited...and waited. My assumption was the ginger infusion was retarding the yeast activity as spices often do, but felt the yeast cells would eventually work through it, which they did. The pan went into a 485F oven with the lid in place and baked for 10 minutes before the temperature was lowered to 450F for the remaining bake time of 45 minutes, with an additional 30- 40 minutes in a cooling oven. When I removed the lid of the pan a caramel and ginger scented waft of steam rose up from it that told me in part that I'd had some measure of success. The loaf had slightly pulled away from the sides of the pan making it very easy to remove the bread, literally dropping out of the unlined pan into my hand. It looked good, with a uniform shape and rich brown, slightly soft crust. When tapped it sounded well baked with no soft spots or cavities that I could detect and it smelled wonderful! The bread was wrapped in linen and left for over 24 hours before slicing to allow what would hopefully be an even celled crumb to set up. Happily the crumb did not disappoint as it's the most open, even celled, high ratio rye bread I think I've achieved in a long while...if ever. The flavour has a good balance between the sweet and sour, with the ginger adding a slightly spicy background note to the overall flavour, rather than predominating, which is what I was after from the start. The dough was intentionally scaled on the small side for the size of pan used since I didn't want a full size loaf of this bread for two reasons. The idea from the beginning was this bread would be used as a base for canapes or small portions of meat, fish, or cheese. More of a cocktail bread than one meant for typical sandwiches was my intention for it. The other reason is that one of the flours included in the mix is a lovely Central Milling Organic Pumpernickel that breadsong http://www.thefreshloaf.com/user/breadsong brought back from a recent trip to California and thoughtfully shared a portion of it with me. 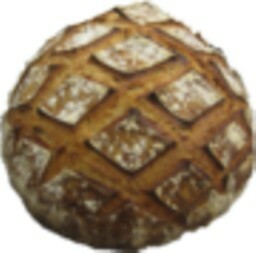 The stock is limited and I'm doing my best to make it last for some other breads I have in mind. Photos, formula and procedure posted below. A few slices with smoked tuna rillettes made earlier in the week. If a true ginger beer is not available, substitute any strong to medium flavoured beer or ale of preference. The ginger infusion/water was made with 120 grams of fresh ginger cut in large pieces, skin on and combined with 270 grams of water in a heavy stainless steel pot. Bring slowly to a simmer and cover with a lid for 60-90 minutes. Remove from heat and allow to steep overnight before using. The ratio of ginger to water was an estimation based on the level of flavour I wanted for this bread. Adjust accordingly to personal preference. Final rise times are approximate. The ginger water infusion seems to retard the yeast activity during this time and patience is needed for an optimum final rise. The dough requires a sealed pan of some kind for baking to keep the baked loaf moist. A standard loaf tin covered with a sheet pan should work in place of a Pullman tin. Heat the ginger beer to 158F/70C and add 50% of the rye flour blending thoroughly. Cool to 68-70F/20-21C before adding the mature starter. Keep the barm at 70F/20-21F for 15-18 hours, adding the remaining rye flour at around the midway point. The barm should be quite active and bubbles breaking the surface before incorporating into the final mix. Make the soaker during the same time as the barm and leave at room temp until final mixing. Add all ingredients to the mixer (or bowl if hand mixing) and mix on 1st speed for 4-5 minutes (7-8 minutes by hand) until a uniform and smooth paste is achieved. Bulk ferment for 45-50 minutes at 82-84F/27-28C. Using wet hands and a scraper shape the paste into a rough log shape 9 ” long and place in a 9x4 Pullman tin. Firmly press the paste into the four corners of the pan and along the sides, making sure it's as square to the corners as possible and the top is flat or very slightly peaked. Final rise/proof temperature is 82-84F/27-28C for 1-2 hours. Bake at 485F/251C for 10 minutes in the Pullman pan with cover on for 10 minutes then reduce the heat to 450F/232C and continue baking for 40-50 minutes. Slide the lid back and check to see if the bread has pulled away slightly from the sides of the pan. Turn the heat off and leave the bread in the oven for an additional 30-40 minutes. Remove from oven and carefully de-pan the loaf to a cooling rack and wrap in linen. Cool for a minimum of 24 hours before slicing to allow the crumb to set. Input desired loaf weight in yellow cell.Input desired %'s in green cells.Do not alter white cells. What an inspired idea, or set of them all rolled into one lovely loaf. A true barm is a great idea, and to extend that to Ginger Beer even better. Actually your timings all would be what I would expect for your different proving stages. One question: did the whole grains soften sufficiently through simply steeping them in boiling water? The usual advice is to cook the grains for a while to soften. I'm quite intrigued as to what Nico is going to say when he sees this!? Many thanks for your compliments on the idea and the loaf itself. It's been a while since I ventured this far into the 'dark-side' and had as much success with a high rye as this one. Very reassuring to know that a rye expert like yourself thinks it OK as well. Hard to say what Nico will think of it but if he feels the same as you I'll be quite pleased. You'll likely see me using barms on regular basis from here on. The flavour they bring to the finished loaf is exceptional. In answer to your question on the grains..yes they did soften enough with just steeping them. 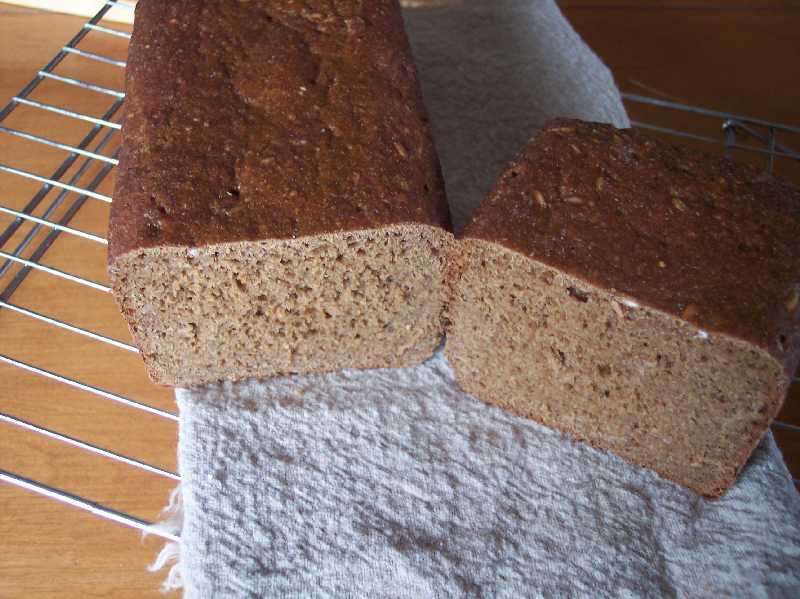 The whole rye grains could have used a slight bit more time under heat but they aren't hard by any means. If you notice in some of the crumb shots a fleck of white near the top, that's where the bread knife sliced through one of the seeds. Perhaps next time I'll cook the grains separate from the meal in order to have them equally soft, but for this loaf I'm rather enjoying the two different textures. Wow, what an elaborate bake! I would have to classify this in the gourmet bread section, to go along with smoked tuna of coarse. What lovely a appetizer. Nicely written up. Thank you for sharing. I guess it could fall in that category, but other than the additional step of making the ginger infusion it's no more elaborate a process than many of the rye breads in Hamelman's 'Bread', and less so than one using the Detmolder method. It's the sort of thing I'll never get to make on the job, so doing it at home is really the only opportunity I'll have to make a bread like this. Thanks so much for your kind words on the loaf, the tuna rillettes and the writeup Sylvia. It's a true pleasure to hear from you as always. Pardon me, but I don't think this is too advanced for someone of your ability. It may be outside your comfort zone...for now, heaven knows it's just inside of mine, but in many ways these high ratio rye breads are easier to mix and shape than wheat based doughs. For me the difficult part is recognizing when the final proof is optimum, and that just amounts to practice to get it right. Glad you enjoyed the post Varda! Next time you're out on the West Coast, stop by and we'll have that lunch. Just try to make it in late Spring or the Summer so we can have it outdoors. 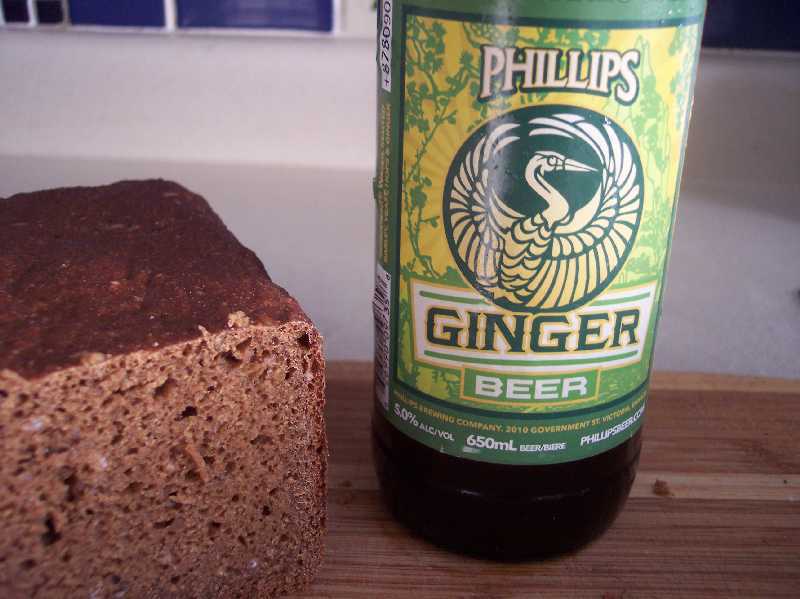 Barms and their uses tend to go completely over my head (I am not a beer drinker) but I have to say I am so intrigued by the flavour combination of the rye and ginger. The loaf looks great by the way, and I bet it tastes better and better every day. I keep reading through all the formula and method ... says "dedication" to me. This is the first time I've used a barm to leaven a dough and I'm mightily impressed with the flavour benefits they give to a naturally yeasted bread. Larry, http://www.thefreshloaf.com/user/wally a well regarded TFL member and professional baker has an expression he uses to describe the use of poolish in a baguette mix as essentially "back loading" flavour into the mix. I couldn't describe the effect that the barm had on the this bread in any better way than that. Rye and ginger is one of those unique natural flavour combinations that flies a little low when it comes to bread and I was curious to see how it would play out in the end. The flavour does change after the first two days, whether it's better compared to the first slice I'm not sure. Some of the rich caramel notes I mentioned in the post are somewhat diminished, but the flavour of the grains is more assertive, and the ginger component has mellowed out. The first two days of eating it were the most rewarding for me, but I'm still enjoying the bread for it's complex and changing flavour profile. Phil, you're own posts have been a true source of inspiration for me lately in terms of dedication to the craft, something that many of us bakers need from time to time. Thanks for your interest and comments, they are greatly appreciated. 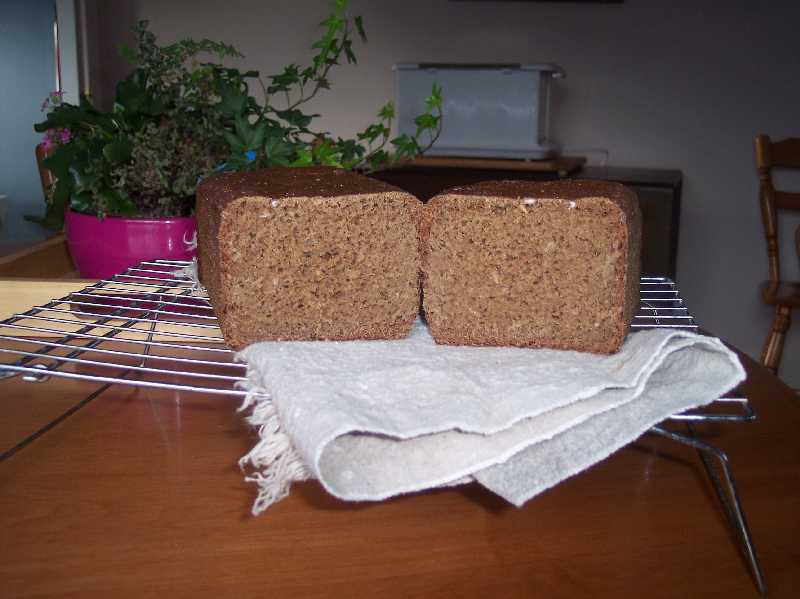 What an amazing loaf you’ve made, and so happy to see you put that CM Pumpernickel Rye to such a beautiful use! for my next try at Cranberry Ginger bread. Thanks so much for being so inventive – this is such a lovely bake! 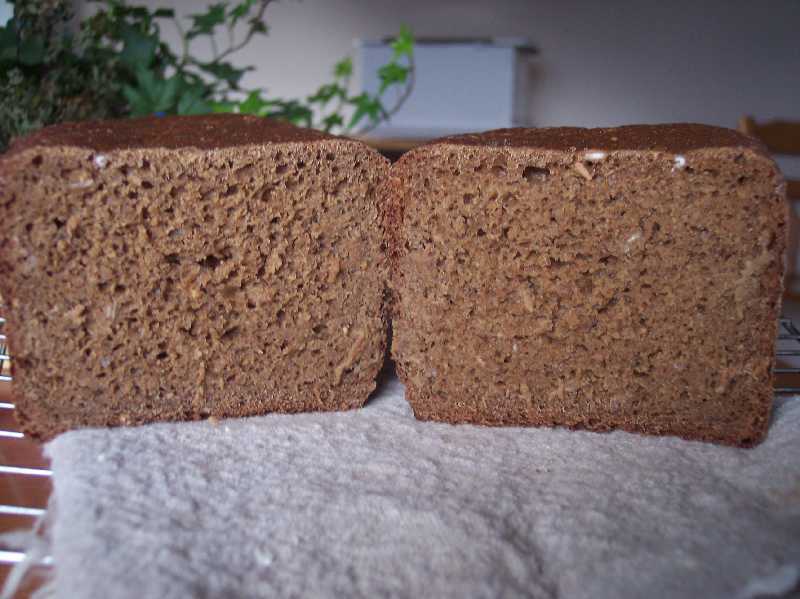 Thanks so much for your compliments on the bread and especially for sharing some of your CM Pumpernickel Rye with me. Very thoughtful and generous of you to do so and I'm looking forward to the opportunity to return the favour to you in some way. That is indeed the Brod & Taylor Proofer in the background. It's easily the most used appliance in the house these days. Today was the first time I've turned it off in 5 days with having it do double duty as a starter incubator and a proofer. A very useful piece of equipment to have, for sure. I think the more natural flavour of the ginger infusion would work well with your cranberry loaf. Powdered ginger I find fairly pungent with a tendency to dominate other more subtle flavours that could use enhancement instead. It's always a treat to hear from you breadsong! Only a very small portion of the ginger beer was needed for the bread so I felt it necessary to drink the rest of the bottle in order to minimize waste. It's the 1st time I've had a true ginger beer and I thought it rather delicious as well. The brewers of the one I used recommend it for having with sushi, which I think would be a brilliant pairing. Quite elaborate writup, Franko! Good work, Rye, and Ginger barm! Yum must be heavenly..! I never tried barm before, as we in the middle east don't brew. but i'd happily test the ginger soaked overnight with rye someday! Hi Khalid, nice to hear from you my friend! I've missed your presence on the site these last few weeks, so it's good to see you back again. I'm not sure if your faith would prohibit you from using a barm or not, but if you used a rye levain and added some non-diastatic malt to the mix you'd have something so close there probably wouldn't be much difference. 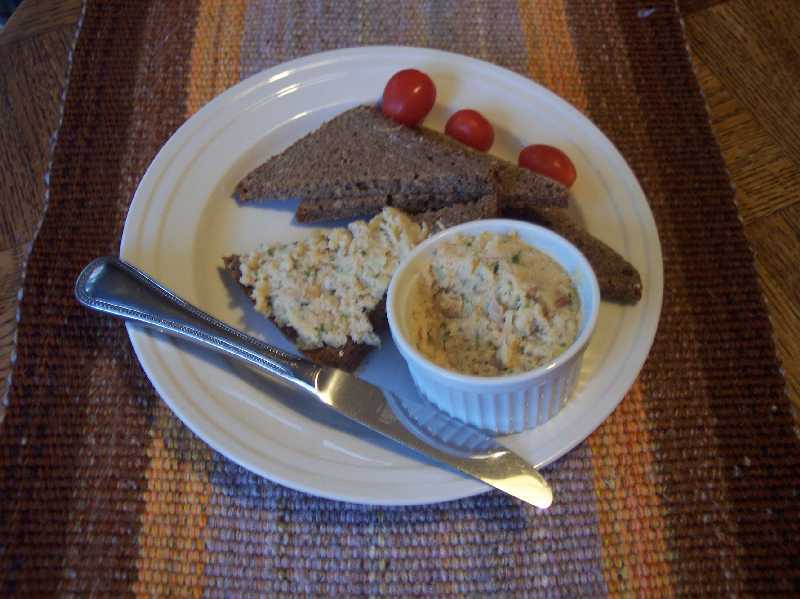 The bread has a nice flavour that goes well with fish, and mild cheese in particular. Hope you try it sometime. All the best to you as well Khalid! You continue to amaze with your creative pairings both in the breads and atop them. Your results are spectacular and the concept of rye and ginger is mentally intriguing to me. I baked this once when Shiao-Ping posted it back when and my notes say it was great then. You've got me thinking about barm again and how it might have been used in olden times. Thank you for sharing your efforts and thoughts on this. I think the idea of rye & ginger must have come from remembering my days as a barman in my 20's. Rye whiskey and Canada Dry Ginger Ale is or was at least, a national drink, second only to our other national beverage. Rivers of the stuff were poured in those years, so something must have stuck with me that this is a flavour combination that might work for bread as well. Glad you enjoyed the post Eric and thank you for the compliments on the loaf. and wish I had a micro brewery up here in this neck of the woods! Will just have to brew my own, I do have a ginger beer recipe from an Australian cookbook I had borrowed years ago, so will have to try it out next year. I can of course bottle beer, having assisted my brother on many occasions, so that is no problem. I collect odd recipes and have a recipe for Spruce beer, you use the tips of the spruce in early spring (or probably anytime) and brew it, I wonder what it would taste like, maybe have to try a batch of that, I have several different spruce in the yard, and they all have a different scent when cut! The up side of trimming the spruce tips is it causes the branches to bush out so you get a nice full looking tree. Did that years ago on a scraggly hedge I had at a house I moved to, it turned them into lovely nice full spruce trees. Thanks so much regarding the flavour combination! I've heard of spruce beer oddly enough. I think I remember reading about it one of Bradford Angier's books about his home in the woods near Hudson Hope back in the 50's or early 60's. I have trouble imagining what it might taste like but I tend to think it would be one of those aquired tastes at best. he wasn't exactly the best writer around, he was regarded by a lot of the old timers as a blowhard who took everyone elses tales and told them like he did them all. I know because I had relatives in the Hope and they were not complimentary at all. But he did have some good stuff in the books whether or not he did them himself, and that is the best one can say about him. Loved reading about this project! Very creative to use the ginger barm, and I think it's so fun that you used the Rye & Ginger Ale drinks of your past to inspire the flavor combo. :) Can't wait to see what you make next. I'm glad you enjoyed the post and the bread. It always fun to try something a little different but I think my next bread will be back to my usual favorites of a country style, wheat based bread. Welcome to the site!